Meet Grant - Cancer Survivor! 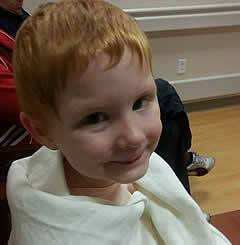 Grant is a four- year-old boy from Illinois who was diagnosed with a rare skin cancer called Spitzoid Melanoma. After receiving treatment in Texas, Grant is considered a cancer survivor and only goes back to Texas every three months for checkups. Grant loves to play games and spend time with his family, especially his two sisters.